As its name suggests, the Betula nigra naturally grows along river banks. But as a landscape tree, it can be planted almost anywhere in the U.S. 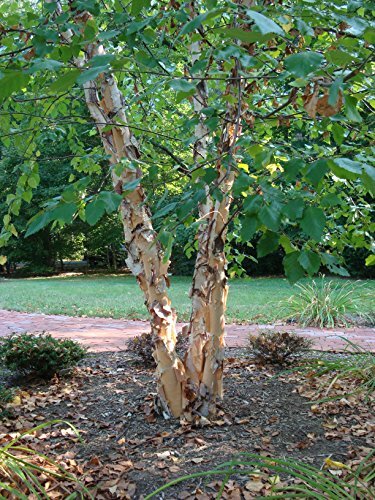 The species is valued for its relatively rapid growth, tolerance of wetness and some drought, unique curling bark, spreading limbs and relative resistance to birch borer. Beautiful bark and yellow leaves in the fall. They make the best partial shade there is. ALL ORDERS TO CALIFORNIA will be delayed until November! This is due to CA state regulations and is beyond our control. Size shipped: 3-4 feet tall, branched in full gallon containers with soil-less media and a 9 month slow release fertilizer. We ship Monday - Wednesday throughout the summer to avoid plant stress over the weekend. This makes the transit time as small as possible and ensures a fresh plant on arrival. Please open the package immediately, read the instructions, and water your plants thoroughly. If you have any questions about this product by DAS Farms, contact us by completing and submitting the form below. If you are looking for a specif part number, please include it with your message.